I’ve noticed these little brown bags of gluten-free snacks on the shelf of one of my local grocery store. I noticed them immediately because I had never seen them before. They are El’s Gluten Free Snacks…and there are two different varieties…Medleys and Snaps. 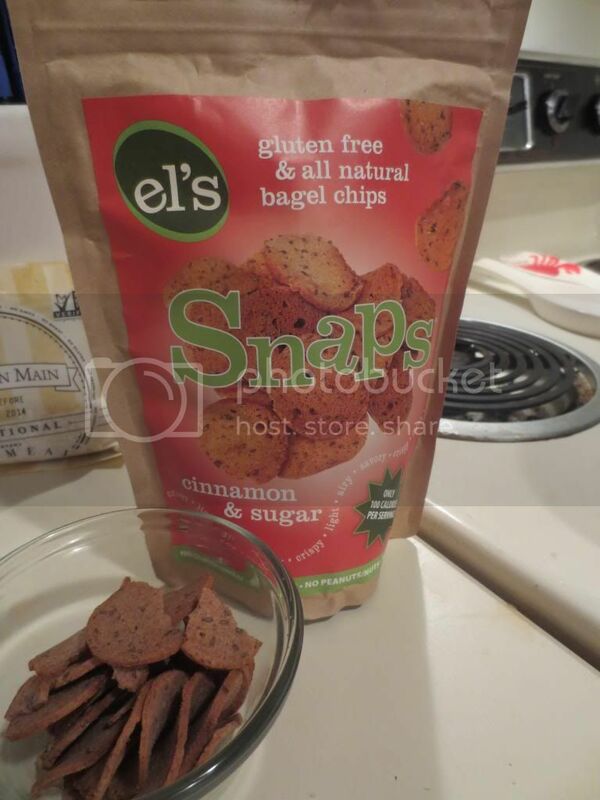 Well, while frequenting a couple of my favorite blogs, a giveaway was happening for the chance to win a bag of El’s Gluten Free Snacks Cinnamon and Sugar Snaps. So, since I was there…and reading…I figured why not enter? I do this all the time, actually…I just never win. But then, Anna from the Gluten Free? Give Me Three blog sent me an e-mail. I had actually won the giveaway. So, she was going to wing a bag of El’s Gluten Free Snacks Cinnamon and Sugar Snaps. I was thrilled. I never win these things…but here…here I had actually won. WOOHOO!! I provided my shipping address…and a couple of days later, a box arrived containing a bag of El’s Gluten Free Cinnamon & Sugar Snaps. I was so excited about these. But…I had a few more snacks ahead of this one…so I set this in my pantry and worked my way through the other items first. But…this past week…the big day arrived. So, here is the thing about gluten-free snacks. They can either be really, really amazing…or not be good at all. And these, at first glance, look as though they might be in the latter category. After all, they are little bagel crisps (think of the highly off-limits Gardetto’s snack mix…the rye chips that people usually love the most) that are lightly dusted with cinnamon and sugar. I normally have my roommate try my snacks…but she just had her last wisdom tooth out, so this time…the opinion rested all on my shoulders. Based on feel alone, I noticed that these weren’t heavy like Gardetto’s rye chips were. These were very light and airy. I loved that. I hate when gluten-free snacks are dense and hard and…bland. I haven’t gotten to that yet. These are very light and it makes you feel good about the snack as you dole out a serving. Snack time arrived at work and I popped open the lid of my container holding a serving of this product. The moment of truth had arrived. One bite. A crunchy, crispy, delicious bite. The texture was awesome. You get this great snap with each bite. And the cinnamon and sugar that is lightly dusted over these doesn’t overpower the rest of the crisp itself. In fact, the taste and crunch is identical to the bagel chips I used to be able to eat. Not to mention, these are baked, which help keep them light, airy, and savory. It’s hard to not devour the entire serving in one quick flick of the wrist. These are honestly that good. So…let’s talk ingredients and nutrition. As far as what these snaps are made from…its a gluten-free flour base, water, non-GMO canola oil, flax seed, cane sugar, and cinnamon. It’s that simple. Not a whole lot going into this, which I appreciate as I’m trying to cut back on processed foods…and when I do eat them, I try to limit the number of ingredients. Speaking of ingredients, not only are these products gluten-free, but they are also free of eggs, milk, soy, peanuts, and nuts. Love the allergy-friendly snacks!! This means I could share them with my nephews if I so choose. I think they’d like them. Nutritionally speaking, a serving is 1 ounce (28 grams). From this serving, you will be receiving 100 calories and 2.5 grams of fat. These crisps are low in sodium, with a serving only providing 240 mg. There are 9 grams of sugar in one serving of the Cinnamon & Sugar Snaps, so it’s not too bad. That’s better than most cereals on the market. And you will also be given 2 grams of fiber and 1 gram of protein. If you are a fan of chips, but don’t want to snack and feel guilty…I highly recommend replacing those chips with these Cinnamon & Sugar Snaps from El’s Gluten Free. Trust me…they go above and beyond as a replacement. I was already looking forward to snack today when I helped myself to another serving of them. Honestly…one of the best gluten-free snacks out on the market. Why? Because at El’s…they believe that good taste matters. I believe they have created the ultimate gluten-free snack foods…and with their focus on taste, texture, and flavor…it’s no wonder I fell in love with them. This entry was posted in Baked Goods, Chips, Food, Gluten-Free, Products, Review, Snacks, Sweet Stuff, Vegan, Vegetarian by The Celiathlete. Bookmark the permalink.